Pictures taken during a Northern Territory holiday (the 'Top End') in August 2005. This gallery shows pictures of a Jumping Crocodile cruise on the Adelaide River and pictures taken in Ubir, Kakadu National Park. Some photographs taken with a Panasonic DMC-FZ10 by David Fong, others taken with a Kyocera Finecam S5r by Stephen Fong. 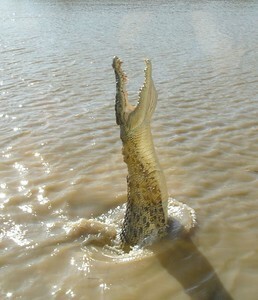 Melaleuca is an old male crocodile on the Adelaide River. I think Melaleuca is about seventy years of age. His right eye and face is damaged from a fight, and his teeth are somewhat worn. Apparantly, he features in a National Geographic magazine as 'the most photographed crocodile in the world'. 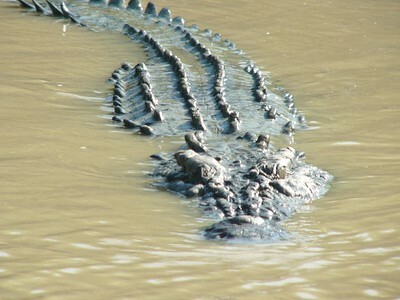 Crocodiles are now a protected species in Australia, and quite a few can be seen during a short river cruise. 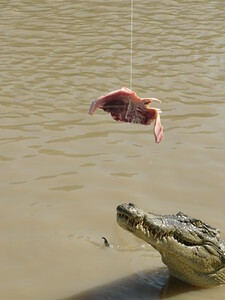 A little bit of meat tempts the crocodiles to come out! 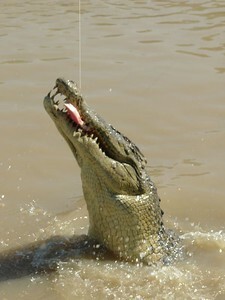 Younger crocodiles were more energetic in jumping for the meat. 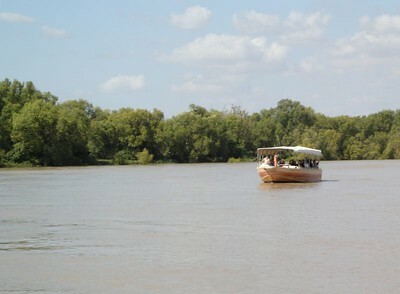 The Jumping Crocodile Cruise on the Adelaide River, Northern Territory, was one of the included boat cruises in a 'Top End Highlight' 3-day bus tour run by Australian Pacific Tours. (This particular boat was not the one we travelled on). 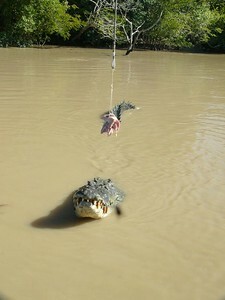 Crocodiles are not the only animals attracted to meat on the Adelaide River. 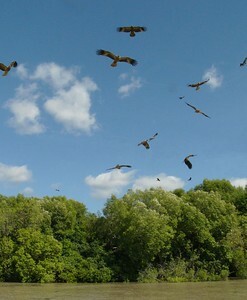 Flocks of birds gathered to pick up a free meal from the boat. 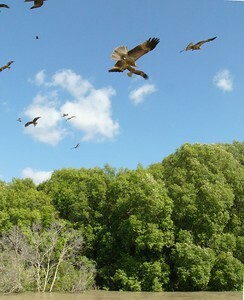 A lot of smaller birds of prey, kites I think, could be seen in Darwin as well. Sometimes they steal lunches, leaving behind nasty flesh wounds in the process. Apparantly, the cruise has a permit to feed these birds. Bowali Visitor Centre, Kakadu National Park. 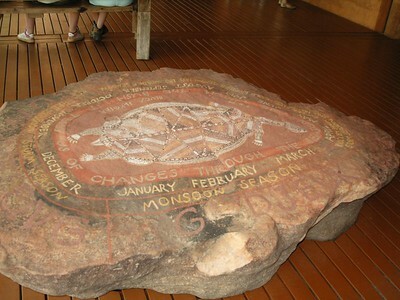 This painting shows something about the seasons at the Top End of Australia. August is towards the end of the 'dry season'. Traditionally, the dry season is the more popular time to go to the Northern Territory because the weather is colder. The temperature in the Northern Territory's capital, Darwin, was about thirty degrees during the afternoon and a minimum of twenty degrees overnight. There is also very little rain during the dry season. 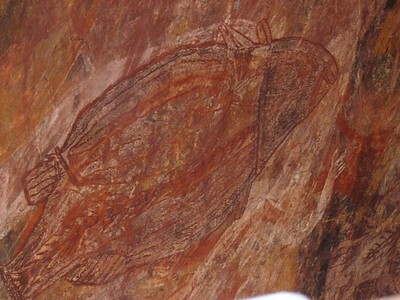 Aboriginal rock painting of a long-necked turtle at Ubirr, Kakadu National Park. 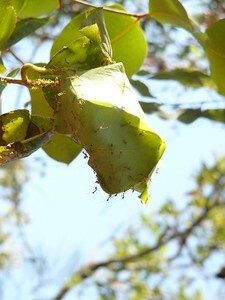 This colony of ants in Ubirr (Kakadu National Park) live between a few leaves. 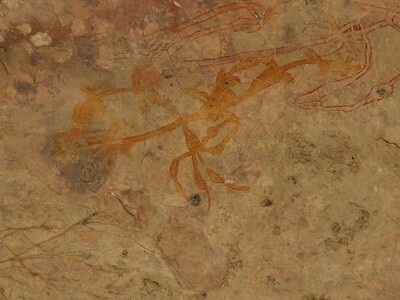 Aboriginal rock painting at Ubirr, Kakadu National Park. 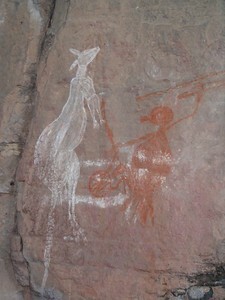 Many Aboriginal rock paintings say something about the food that the locals ate and hunted for. 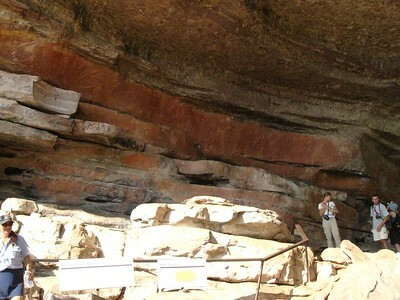 Some rock paintings are high up on inaccessible walls. Some people say that the paintings were drawn by Mimi (spirits), or with the help of spirits. Alternatively, maybe old ledges have collapsed after the paintings were drawn. Just to the left of this scene, high above the ground, is a painting of a thylacine (Tasmanian tiger). The thylacine is an extinct carnivorous marsupial, the last one dying during the twentieth century. The thylacine is thought to have disappeared from the Kakadu three thousand years ago. Incidentally, our bus driver and tour commentator can be seen on the bottom left of this photograph. As a woman, she claims the special power of being able to talk and drive at the same time! 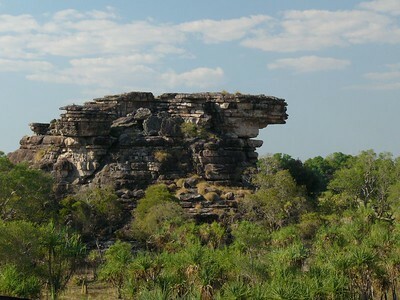 Ubirr, Kakadu National Park. View on the way up to Nadab lookout. 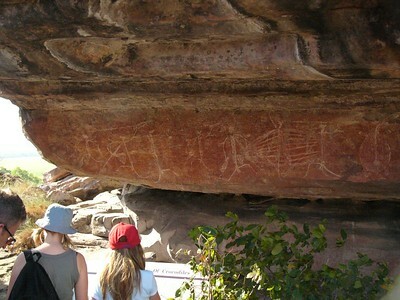 Aboriginal rock painting at Ubirr, Kakadu National Park. This is a picture of a fish done 'X-Ray' style. 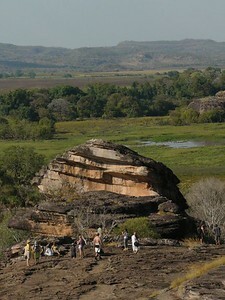 Ubirr, Kakadu National Park. View from Nadab lookout. 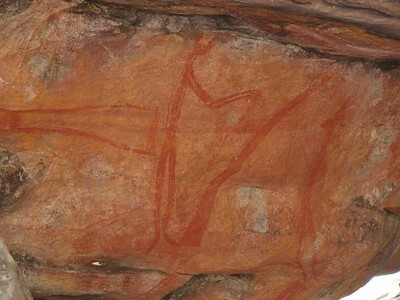 Some aboriginal rock paintings depict relatively 'recent' events! 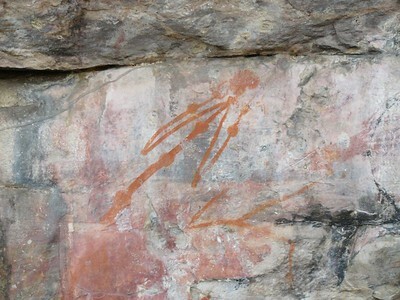 Aboriginal rock painting at Ubirr, Kakadu National Park. 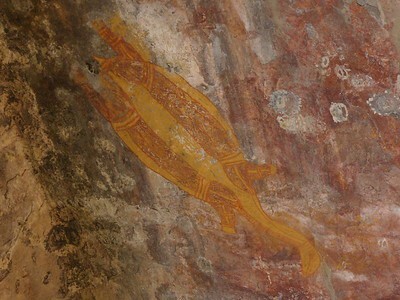 This rock painting depicts a 'dream-time' story of two sisters, the Namarkan sisters, who could turn into crocodiles (and back into humans) at will. They could then play tricks on people, scaring them out of their wits. Unfortunately, they then stayed crocodiles. Their spirit is in each crocodile, giving the crocodiles a mischievous glint in their eyes. Their spirits can also reach into people with something like strings, causing illness. 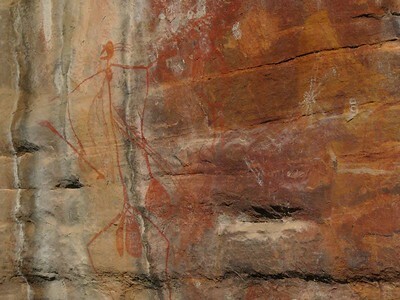 This aboriginal rock paintings depicts an ill person with swollen joints. The accompanying explanation board states that the illness is 'miyamiya'. This illness afflicts people who disturb a sacred site near the East Alligator River.